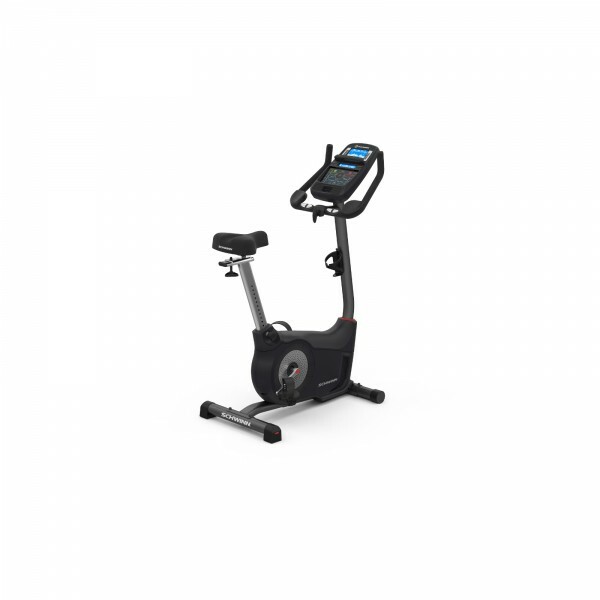 The Schwinn upright bike 570U is an elegant, innovative fitness machine with an extensive equipment. 29 different training situations can be called, 25 resistance lvels are available on the Schwinn upright bike 570U, which can be modified by a motor controlled magnetic brake. Using the quick start button, you start your training immediately. 12 programmes (programmes with intervals) provide a diversified training. Four programme can be saved for individual profiles. The upright bike offers two fitness tests and nine heart rate programmes to avoid over loads and to do the training in the optimal zone - four for beginners, four for advanced users, and one programme, that can be used by a guest. The pulse beat is measured on the hand when heart rate programmes are done, two sensors in the handles detect the current rate and transmit it to the computer in your upright bike. The rate can also be measured with a chest strap, which is available as accessory. In the handles of the upright bike, there are pads integrated, which support the elbows, just in case you want to work out in the triathlon position. Two wide, rubberised feet and the relatively high weight (28.5 kg) provide a safe and nonslip stability. Even at higher speeds, the upright bike remains where it is, does not wobble, and nothing moves! By means of two wheels, which are integrated in the front base, the training machine is easy to move. The saddle can be individually adjusted in height and horizontal position. That's important for the correct pedalling angle. Extras for a more comfortable training: the three-level fan, a big cup holder, and the sound system, to which a MP3 Player can be connected. The LCD display is blue backlit and convinces by a high contrast. Two loudspeakers are above the display, which can be connected with a MP3 player. The current information is displayed on two high-resolution STN-LCD displays. The data can be transmitted via bluetooth to the computer or be read by a USB stick. Fitness Apps like the own Schwinn Trainer App or popular Apps like "MyFitnessPal2, "Under Armor Record" or platforms like Google Health or Apple Health help to achieve the training targets. Watch films on the iPad or read a book in the ebook reader while working out? No problem with the Schwinn 570U. The upright bike has a holder for tablets. Two LCD displays inform about data of the current training. When the bigger main display is covered by an ebook Reader, for instance, you can still read all important data from the smaller display. The drive system of the upright bike works almost silent and provides a well-balanced, harmonic run without jerking or imbalance. The Schwinn 570U upright bike is compatible with RunSocial, the ultimate and interactive training App. Using it, your training becomes a real experience! The App shows on the iPad (or a tv) real tracks like real HD video shots. For instance, you can: drive along the beach of Santa Monica or conquer the Swiss Alps, organise events with other persons, and find out whether another person uses the track at the same time - even the participation in official events is possible! Three-dimensional virtual reality, combined with social networking! A MP3 connection connects smart phone and upright bike. Both integrated loudspeakers make it possible to go without headphones, which disturb the training sometimes. For smart phone or tablet, the console offers sufficient space, so that the comfort is given here as well while doing your training with the 570U. Schwinn upright bike 570U add to comparison list.